In horoscope interpretations Neptune loosely indicates the incorporation of something mysterious into a personality. It is mainly concerned with imagination, dreams and extra sensory perception. This is the planet that influences a person's responsiveness to stimuli and gives us all our unique vagueness and individuality. Neptune takes over 60 years to orbit and is thought to be responsible for determining our subconscious choices and their resulting actions. It is significant in Astrology studies as it helps us to account for the wide variation of different personality types and all their individual characteristics. Without its presence horoscopes may be easier to read but they will not be infused with such originality. 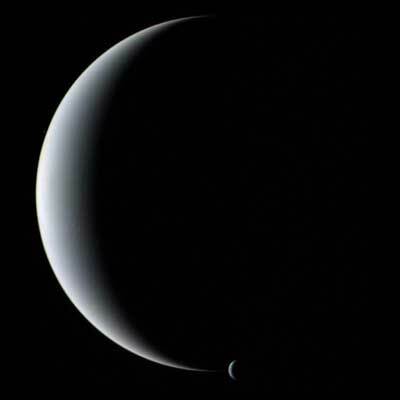 Neptune is the most far away planet from our Sun in our Solar System and is thought to be named after Titan God of the Sea. This planet was discovered by mathematical means as it is not visible from Earth. 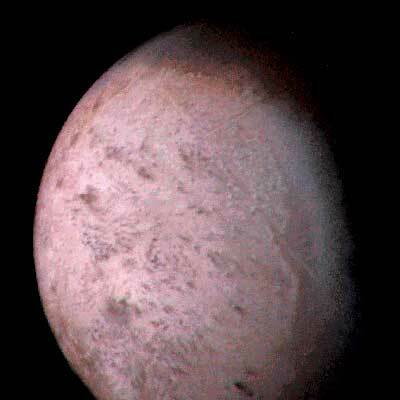 It is primarily composed of Hydrogen, Helium and hydrocarbons and has an ice and rock core similar to Uranus's. 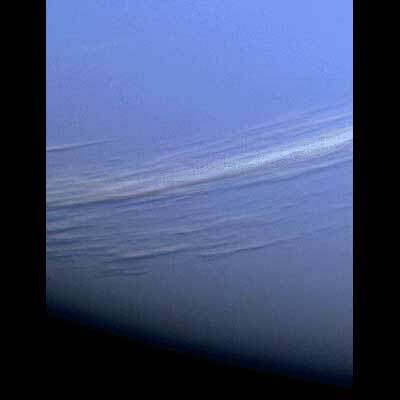 Sometimes this planet radiates a bluish tint and this is thought to be because of traces of Methane that have built up around its edge. The atmosphere is extremely cold and windy and storms are common among the weather patterns. Neptune in astrological representations is associated with the creative, expressive and emotional side of our personalities. Of the very rare myths about Neptune most are about the Greek God Poseidon who became the Roman deity who the planet is named after. 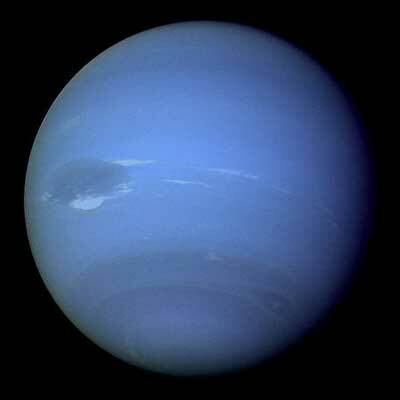 Neptune was the brother of Jupiter and Pluto. Following the defeat of their father Saturn the three brothers are believed to have divide the world into three parts, one each. Jupiter took the sky, Pluto asked for the underworld and Neptune gained command over the Sea. 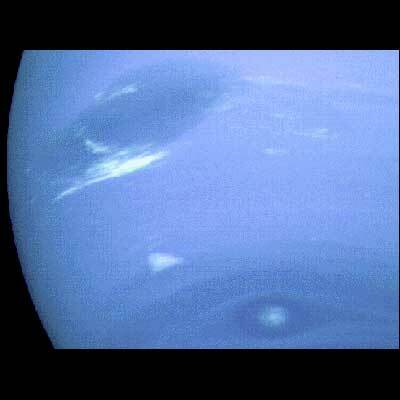 Neptune made his presence felt by evoking wild storms and earthquakes when he was angered. He had a quick temper and is depicted as always carrying his trident ready to vent his rage. 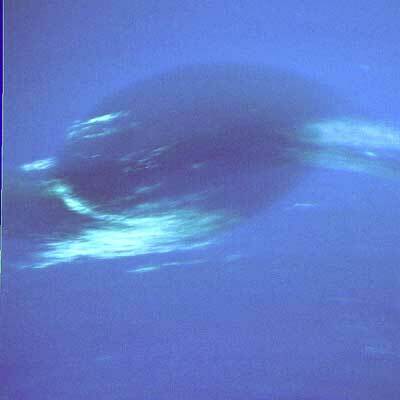 Neptune was feared and news of his existence was widespread. and so he was naturally highly respected and admired. The legend of how Neptune chose his bride the water nymph called Amphitrite highlights his influencing insight and inspiration. Legends say that upon her refusal to marry him he was not discouraged and set about devising a plan. He asked his trusted servant the Dolphin to locate her and persuasively plead with her to reconsider Neptune's offer of complete devotion. The Dolphin managed to express upon her how much Neptune loved her and he was successful in marrying her. As a reward to the Dolphin for his loyalty and hard work he was granted immortal life and placed in the heavens. This little mythical tale sums up Neptune's message of perceiving what is not there and making it happen. Neptune's position and influential power in astrological birth charts can sometimes be sensed rather than known. This planetary zodiac influencer offers insight into a person's way of thinking and how they utilize their thought sequences in order to make their decisions in life. We all have are own way of thinking about things and Neptune is presumed our personality guide in this area. He taps into the subconscious level of our thoughts and gives us the means to discover the effectiveness of our contemplation procedures. It helps us visualize things in an ideal form so we can aim our sights for this imagined perfection. The connection to dreaming from Neptune's appearance ties in with his intention of creating imaginative realities. Symbolically Neptune is represented by a combined crescent and cross shape bearing the resemblance of Neptune's trident. This is probably one of the most easily identifiable symbols in any astrological writing or interpretation. The down turned crescent is meant to signify human spirit and the cross symbolizes the mind surpassing the matter. This icon reinforces the message of Neptune by reminding us that things that are not acted out and emotionally displayed remain inside. This planet's influential forces are here to teach us how to idealize and dream up ideas to realize our thoughts and put them into some kind of positive and effective action. Neptune is astrologically ruled by the Western Sun sign of Pisces whose identification is the fish. This is an apt arrangement as Neptune has connections with the Sea and it increases the influencing possiblities in a person's character formation. Pisces is typically known for their deep thought, sensitivity and dreaminess. With these traits alongside Neptune's haze of mystery it is simple to remember that his most prominent communication of guidance with sensory awareness and its advantages. Neptune locations can help give an indication of how in tune people are with their fabled sixth sense. A strong prominence of this orbital body in your natal map can uncover a highly astute individual who follows his or her instincts. Mass (kg) 1.02 x 1026 Diameter (km) 49528 Mean density (kg/m3) 1640 Escape velocity (m/s) 23300 Average distance from Sun 30.07 AU (4,498,252,900 km) Rotation period (length of day in Earth days) 0.67 (19.1 hours) Revolution period (length of year in Earth days) 60,190 (164.8 Earth years) Obliquity (tilt of axis degrees) 29.6 Orbit inclination (degrees) 1.77 Orbit eccentricity (deviation from circular) 0.009 Mean temperature (K) 48 Visual geometric albedo (reflectivity) 0.51 Atmospheric components 74% hydrogen, 25% helium, 1% methane (at depth) Rings Rings are narrow, and contain concentrations of particles called ring arcs. 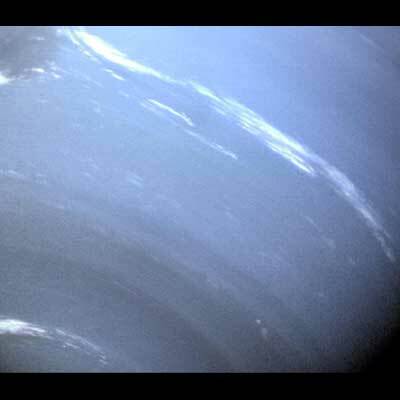 The rings around Neptune are so faint that when Voyager's cameras captured this image, the brightness of Neptune nearly made them impossible to detect. 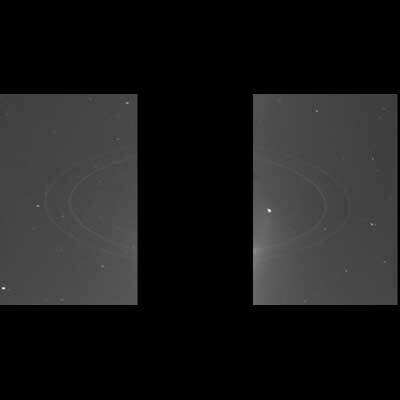 The black box in the center of the image is where Neptune was blocked out because no detail was visible given the long exposure time required to capture the almost invisible rings. 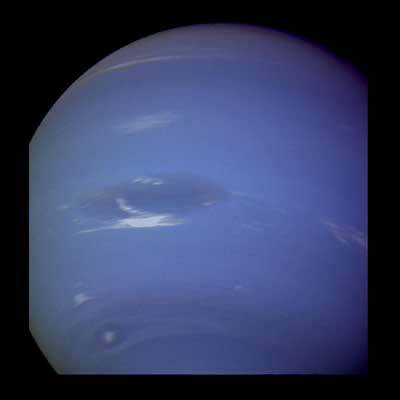 The bright glow at the edges of the black box is some of the light reflected from Neptune. Two sharp rings are visible, Leverrier and Adams, and one faint ring, Galle, is barely visible inside them. 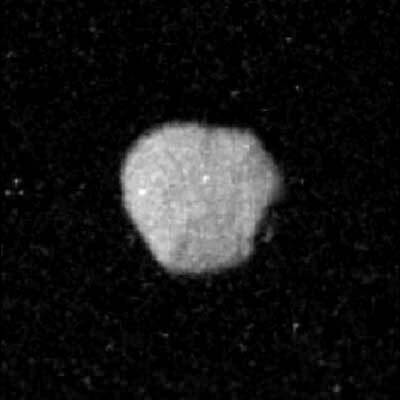 With an average radius of only 200 km (120 mi), this tiny half-illuminated satellite appears spectrally gray with an albedo of 6%. 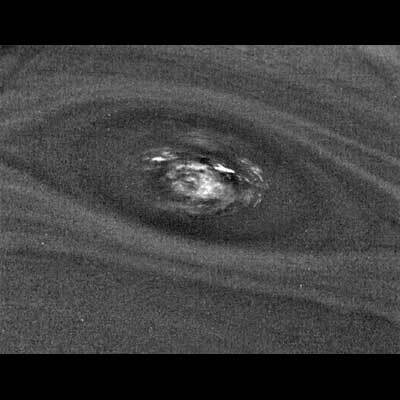 Hints of crater-like forms and groove-like lineations can be seen. The graininess of the image is caused by the short exposure necessary to avoid significant smear. eptune was the chief of the water deities Neptune was the chief of the water deities. The symbol of his power was the trident, or spear with three points, with which he used to shatter rocks, to call forth or subdue storms, to shake the shores, and the like. He created the horse, and was the patron of horse races. His own horses had brazen hoofs and golden manes. They drew his chariot over the sea, which became smooth before him, while the monsters of the deep gambolled about his path.